Preparation time: 10 minutes. Cooking time: 8 minutes. Fill a large saucepan or stockpot 2/3 full with water. Bring to a boil over high heat. 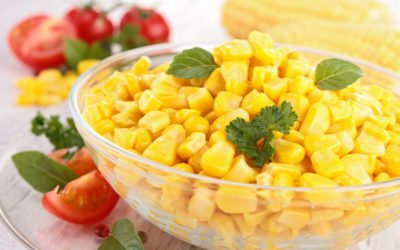 While water heats, remove husks and silk from corn, then add corn to boiling water, cooking it no more than 8 minutes. Carefully remove with tongs and allow to cool to room temperature on a plate. In a blender or food processor, puree cottage cheese until smooth. Using a sharp knife, slice corn kernels off cobs and place in a small mixing bowl (yield should be about 2 cups). Add cottage cheese, mayonnaise, red pepper, parsley, black pepper, and dill and stir to combine. Pour into serving dish. Slice cherry tomatoes in half and place around the rim of the dish as a garnish. Chill prior to serving if desired, or serve at room temperature. Exchanges per serving: 2 carbohydrate, 1/2 fat. Carbohydrate choices: 2.